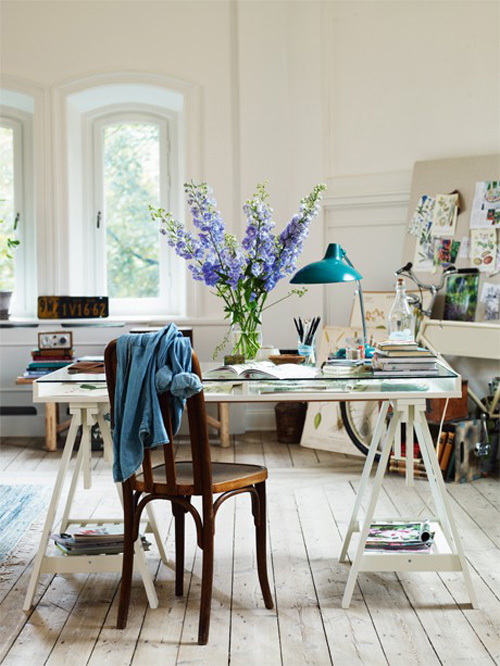 Today I’m loving … this light and spacious office space. wow! I love all that space and the desk with the space below the glass, it could be very useful when you don´t have a big desk (like me!!!). Beautiful light space! Love the timber chair/light desk and floor combo. The lamp is also a winner! this is sooo nice! i love it! Now this is what I wish my office space looked like. So roomy and fresh feeling. Mines more like a old building- after being demolished. i have a crush on it!!!! thanks for sharing!! does anyone know where this desk is from?